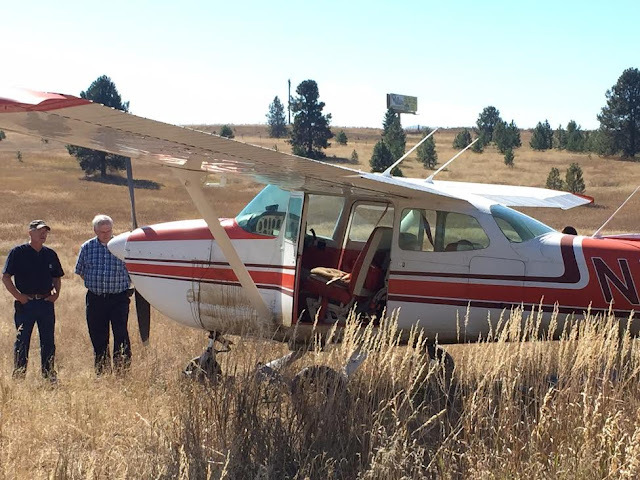 A single-engine airplane was forced to make an emergency landing in a field west of Missoula on Friday. Both occupants walked away unscathed. 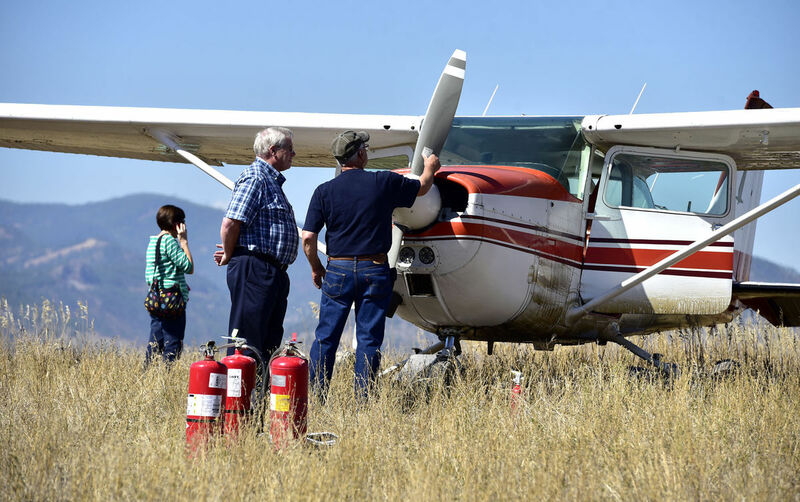 Pilot Roy "Skip" Owings and his wife Judy, both local residents, had just left the Missoula Airport in the Cessna and were about 10 miles north of Evaro when Roy noticed a little vibration in the engine and saw that he had lost all his oil pressure. "When he uttered the word Mayday to the control tower, that put more than an alert in my thinking and I commenced to pray ardently," Judy Owings said. "Probably my first thought was he’s an amazing pilot and so thorough in all his pre-flight (inspections). I knew that if something was awry, it was not his negligence at all." Roy decided the plane wasn't going to make it back to the airport, so he picked a field near the Wye that didn't have any trees. Other than the engine damage, the plane was fine. He said he has "been very diligent about rehearsing this kind of stuff in my mind for years and years and years. It’s almost like clockwork." And on Friday, it paid off. Judy said that when she realized that they were going to have to land in a field, she was confident in her husband’s ability. She said the landing was very bumpy. Owings first got his pilot’s license in Seattle in 1974 and has more than 700 hours of flying experience. They owned an equipment company in Missoula, but Owings now works for Halliburton. They were headed to Kalispell to visit his mother. Owings said he flew the plane from Utah the day before for work, and everything was fine. Firefighters from the Frenchtown Rural Fire Department were on the scene shortly after the landing at about 11:30 a.m., and the Missoula County Sheriff’s Department responded as well. The plane did not start a grass fire. Judy said she’s never heard her husband say the word “Mayday” before. Roy Owings said the FAA will have to conduct an investigation and the plane is going to have to get towed out. He said he’s never had to declare an emergency before. MISSOULA - No injuries have been reported after a small plane made an emergency landing in a field northwest of Missoula on Friday morning. 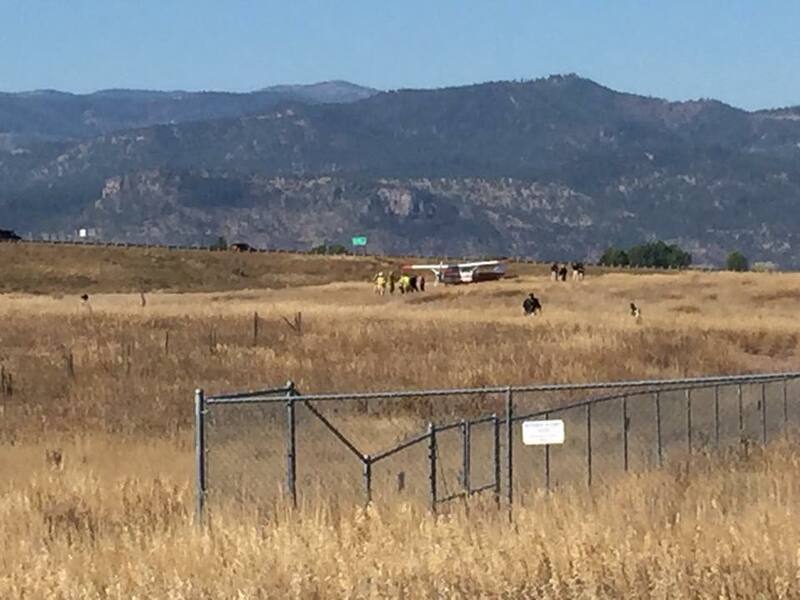 The single-engine Cessna went down in a field near the Jellystone RV Park. Authorities say the aircraft experienced mechanical issues after taking off from Missoula International Airport. 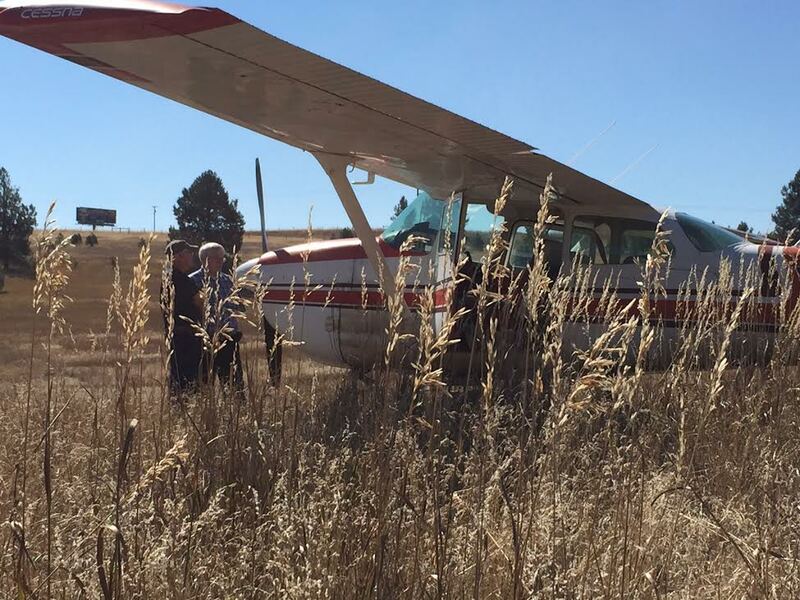 The pilot attempted to return to the airport but ended up being forced to make an emergency landing in the field. On August 30, 2016, about 1801 Pacific daylight time, a Beechcraft A-36 Bonanza airplane, N985CA, was destroyed when it impacted the ground in a recreational vehicle (RV) park about one-half mile prior to the threshold of runway 16L at Reno/Tahoe International Airport (RNO), Sparks, Nevada. 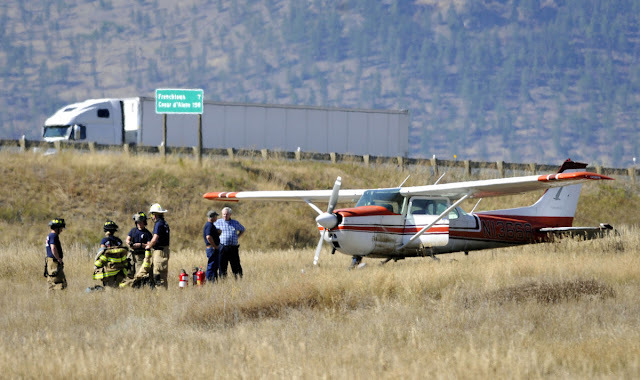 The commercial pilot and passenger received fatal injuries, but there were no ground injuries. The airplane was registered to a private individual, and operated by Flying Start Aero, a flight school based at RNO. The flight was conducted under the provisions of Title 14 Code of Federal Regulations Part 91. Visual meteorological conditions prevailed, and no flight plan was filed. The flight departed Henderson Executive Airport (HND), Las Vegas, Nevada, about 1600, and was destined for RNO. According to one passenger who was on 3 of the flight legs that day, the plan was for the pilot to depart RNO with 2 passengers, pick up a third passenger in Las Vegas, Nevada, and continue on to southern California, where the 3 passengers were to attend a business meeting. Later that day, they planned to reverse that sequence, with the airplane, pilot, and 2 passengers returning to RNO in the late afternoon or early evening. All 3 passengers were employees of the same company, which was based near RNO. According to the passenger, he and another passenger arrived at the Atlantic Aviation facility at RNO at 0350; the pilot was already there, and they proceeded to board the airplane. The flight departed RNO about 0410, and landed at Henderson Executive Airport (HND), Las Vegas, Nevada, sometime after 0600. That flight leg was smooth and uneventful. HND fueling records indicated that the airplane took on 30 gallons of fuel sometime between 0624 and 0647. The airplane departed HND, and landed at French Valley Airport (F70), Murrieta/Temecula, California sometime after 0900. The 3 passengers then left the airport by car for their meeting and returned about 1300. The passenger did not know what the pilot did during the intervening hours. The 3 passengers then re-boarded the airplane for the flight to HND. That trip leg was very bumpy. Prior to departure for the last leg of the flight to RNO, two of the passengers decided not to accompany the pilot and the third passenger on the flight back to RNO. According to a flight instructor at Flying Start Aero, the pilot had telephoned sometime during the day to report that his passengers were running late, and that he would be returning to RNO later than originally planned. According to HND fueling records, the airplane was "topped off" with 24.3 gallons of fuel sometime between 1520 and 1530. Federal Aviation Administration (FAA) records indicate that the airplane took off from HND about 1600, and that the pilot requested and received flight following services for the visual flight rules flight. The pilot first contacted the RNO air traffic control tower (ATCT) when the airplane was about 9 miles southeast of RNO. About 2 minutes later, the pilot reported that he was on downwind for runway 16L. About 2 minutes after that, the pilot was advised that his traffic was a Boeing 757 (B757) on a 9- mile final for runway 16R, was provided with the wind information, and was cleared to land. About 1 minute later, the pilot advised that he had "the airliner" in sight, and the accident airplane turned from westbound to southwest-bound, towards runway 16L. The pilot squared off the pattern once it got closer to the airport and turned onto the final approach leg to runway 16L about 1 mile from the runway threshold. Multiple eyewitnesses reported that the airplane appeared to be approaching normally, without any unusual sounds or dynamics, or any smoke or other outward signs of distress. Just as the airplane was over the RV park, and at an altitude of less than 200 ft, it rapidly rolled and descended to the ground. Ground scar and debris information was consistent with a near-vertical descent, in a near-vertical, nose down attitude. The airframe and engine incurred significant impact damage and were then further damaged or consumed by the post-impact fire. The 73-year-old pilot and his wife were the co-owners of Flying Start Aero, and the pilot was also the chief flight instructor. FAA information indicated that the pilot held commercial and flight instructor certificates with airplane single engine and instrument ratings. He reported a total flight experience of 11,100 hours on his most recent application for an FAA third-class medical certificate, which was issued in March 2016. The pilot's most recent flight review was completed in October 2014. Copies of the pilot's logbook were provided by the Flying Start Aero attorney. The most recent entry in the logbook was dated August 13, 2016. The logbook indicated that as of that date, the pilot had accrued a total flight experience of about 11,326 hours, all of which was in single engine airplanes. About 9,846 of those hours were logged as provision of flight instruction. A review of the pilot's flight logbook back to August 2015 revealed 8 entries that were cataloged as something other than flight instruction. Six of those entries were conducted in a C-172, and the remarks included "scenic" for each of those entries. The entries did not contain any information regarding whether they were conducted in support of any charitable, non-profit, or community events, and did not indicate their range from the airport of origin. The other 2 entries, dated April 11-14, 2016 and June 12, 2016, were conducted in the accident airplane, and did not contain the "scenic" annotation in the remarks section. Both entries indicated that the flights originated and terminated at RNO, with a stop at an interim location. Neither of the interim landing locations were decipherable. The entries did not contain any information regarding whether they were conducted in support of any charitable, non-profit, or community events. The remarks for the April 11-14 flights appeared to state "visit Lin" but the remarks for the June 12 flight were not decipherable. According to the pilot's wife, the evening before the accident, he went to sleep about 2000, and awakened at 0330 the morning of the accident. She also reported that the pilot was "in good health" without any "significant related issues or problems." According to Google Maps, the pilot's home was located a minimum driving distance of 6.3 miles from Flying Start Aero, with a drive time of about 17 minutes. The pilot's presence at the airport at 0350 was consistent with his leaving his home about 0330. The direct distance from RNO to HND was 305 nm, and 174 nm from HND to F70, for a minimum total round-trip distance of 958 nm. Based on witness information, the flight time from RNO to HND was about 2 hours and 20 minutes, and from HND to F70, somewhat less than 2 hours. The investigation was unable to determine how or where the pilot spent the approximately 4 hours between his arrival at and departure from F70. The return trip leg duration from F70 to HND appeared to be about 2 hours. FAA air traffic control ATC information indicated that the return leg from HND to RNO was also about 2 hours. Based on this information, the pilot's total flight time for the day was about 8.5 hours and included 4 takeoffs and 3 landings. The accident occurred about 14 hours after the flight's departure from RNO. FAA information indicated that the airplane was manufactured in 1981 and was equipped with a Continental Motors IO-550 series engine. Delivery documents indicate that the airplane was not equipped with a supplemental oxygen system. The airplane was owned by Venture Aviation Services of Reno Nevada and was placed on leaseback to Flying Start Aero in November 2014. The leaseback contract between the airplane owner and Flying Start Aero explicitly limited the airplane use to "commercial pilot flight training" and "rental to pilots approved by [the Flying Start Aero owner, who was also the accident pilot], as per insurance policy." The airplane owner told the investigator-in-charge that Flying Start Aero took very good care of the airplane, and did not defer any maintenance items. The most recent annual inspection was completed in November 2015. According to the records for that inspection, the airplane had a total time (TT) in service of about 5,528 hours, the engine TT and time since overhaul (TSMOH) were about 998 hours, and the tachometer registered about 3,747 hours. The only maintenance record entry subsequent to the 2015 annual inspection was for an oil and oil filter change in February 2016. At that time the airplane had a TT of 5,550 hours, the engine TT and TSMOH were about 1020 hours, and the tachometer registered about 3,769 hours. The investigation was unable to determine the airplane TT at the time of the accident. The 1755 RNO automated weather observation included wind from 290° (true) at 17 knots, gusting to 20 knots, visibility 10 miles, few clouds at 10,000 ft above ground level, temperature 31° C, dew point -5° C, and an altimeter setting of 30.01 inches of mercury. About 1757:18, the RNO ATCT controller advised the pilot that the wind was from 260° (magnetic) at 13 knots, with gusts to 18 knots. About 1758:53, the RNO ATCT controller advised "all aircraft" that automated terminal information service (ATIS) information "Kilo" was current, and that the wind was from 250° (magnetic) at 17 knots, with gusts to 20 knots. When the airplane was about 35 miles southeast of RNO, and about 17 minutes before the accident, the pilot confirmed to the NCT controller that he had RNO ATIS information "Juliet." Based on the available evidence, ATIS Juliet was likely based on the 1655 (PDT) METAR, which included wind of 230° (true) at 13 knots. The ATIS Juliet information prompted the pilot to respond that he wanted runway 25 when he was asked by the NCT controller. A wind from 230° (true, 216° magnetic) would have resulted in a 50° crosswind for a runway 16L landing. At the time of the 1757:18 LC1 wind advisory (260° mag/13G18), the airplane was about 6.7 miles east-northeast of RNO, turning northwest, at an indicated altitude of about 7,900 ft.
At the time of the 1758:53 LC1 ATIS "Kilo" broadcast (250° mag/17G20), the airplane was about 3.5 miles northeast of RNO, on a wide, diagonal left base leg for runway 16L, at an indicated altitude of about 5,700 ft. From that location, if it turned about 50° to the left, the accident airplane could have entered a right base leg that would result in a 2 mile final for runway 25. US National Oceanic and Atmospheric Administration data indicated that at RNO, about 3 minutes before the accident, the sun was at a true azimuth of about 267°, and an elevation about 17° above the theoretical horizon. RNO was situated at an elevation of 4,415 ft above mean sea level (msl). RNO was equipped with 3 paved runways, designated 7/25, 16L/34R, and 16R/34L. Runway 7/25 measured 6,102 ft by 150 ft, runway 16L/34R measured 9,000 ft by 150 ft, and runway 16R/34L measured 11,001 feet by 150 ft. Magnetic variation was about 14° east. The centerlines of runways 16R and 16L were separated by 700 ft. Although the paved approach (north) ends of runways 16R and 16L were abeam one another, runway 16R had a displaced threshold of 1,000 ft. Runway 16R was equipped with a 4-light PAPI (precision approach path indicator) system with an approach slope of 3.06°, and a threshold crossing height (TCH) of 77 ft. It was also equipped with an ILS (instrument landing system) approach with a glide slope of 3.1°, and a TCH of 59 ft. Runway 16L was equipped with a 4-light PAPI system with at 3.0° slope, and a TCH of 75 ft. Runway 16L did not have an ILS approach system or procedure. This geometry results in the 16R approach path being higher than the 16L approach path for a given distance from the pavement ends; for 2 aircraft abeam one another and on the respective approach slopes, the aircraft on approach to runway 16R would be higher than the aircraft on runway 16L. The 16/34 runways intersected runway 7/25 at its approximate mid point, while runway 7/25 crossed the 16/34 runways about 6,300 ft from the north ends of the 16/34 runways. The available landing distance from the runway 25 threshold to the eastern edge of runway 16R was about 3,327 ft. The Flying Start Aero ramp and office were located northeast of the runway intersections. The airplane impact location was situated on the extended centerline of runway 16L/34R, 2,843 ft north of the runway 16L threshold. Site elevation was 4,436 ft msl. With the exception of a few small fragments and the forward right cabin door, the wreckage was entirely contained within a semi-circular area approximately 25 ft in radius. The bulk of the wreckage was very tightly contained, and consisted of the remains of both wings, the fuselage, empennage, engine, and propeller. All components in the main wreckage exhibited extensive aft crushing and/or thermal damage or consumption. The cabin roof, floor, and seat were mostly destroyed by post impact fire. Portions of both ailerons and both flaps were identified in the wreckage. Aileron control cable continuity was verified, but no information regarding cable routing could be determined. The available evidence was insufficient to determine the flap position at impact. Both horizontal stabilizers remained attached to the aft fuselage, and both elevators remained attached to their respective stabilizers. Both elevator balance weights were located in the wreckage. Due to impact and thermal damage, elevator control continuity could not be verified. The extensions of the 2 pitch trim actuators were consistent with a neutral (faired) position. The vertical stabilizer remained attached to the fuselage, and the rudder remained attached to the vertical stabilizer. The rudder balance weight remained attached to the rudder. Due to impact and thermal damage, rudder control continuity could not be verified. Most of the cockpit instruments and controls were destroyed by the combination of impact and fire. The fuel selector valve was determined to be set to the "right tank" position. The landing gear retraction/extension bellcrank assembly was consistent with the landing gear being in the extended position at impact. The only identifiable component of the ELT was the battery pack, which sustained impact and thermal damage. No evidence of any supplemental oxygen system components was identified in the wreckage. The engine crankcase halves were mostly intact. The crankshaft propeller flange separated and remained with the propeller. All cylinders remained attached to their respective mounts on the crankcase halves and exhibited impact and external thermal damage. Most engine accessories were fracture-separated from the engine. Almost all engine components exhibited significant impact- and/or thermal damage. A lighted borescope examination of all 6 cylinders revealed that all exhaust and intake valves were intact, in-place, and exhibited normal combustion deposits and coloration. The propeller and hub assembly were fracture-separated from the engine crankshaft. All 3 blades remained installed in the hub. The assembly was found with the forward ("blade back," or cambered) side down, partially embedded in the asphalt. The propeller impact damage and the ground scars were consistent with the impact occurring with the plane of rotation parallel to the ground plane. 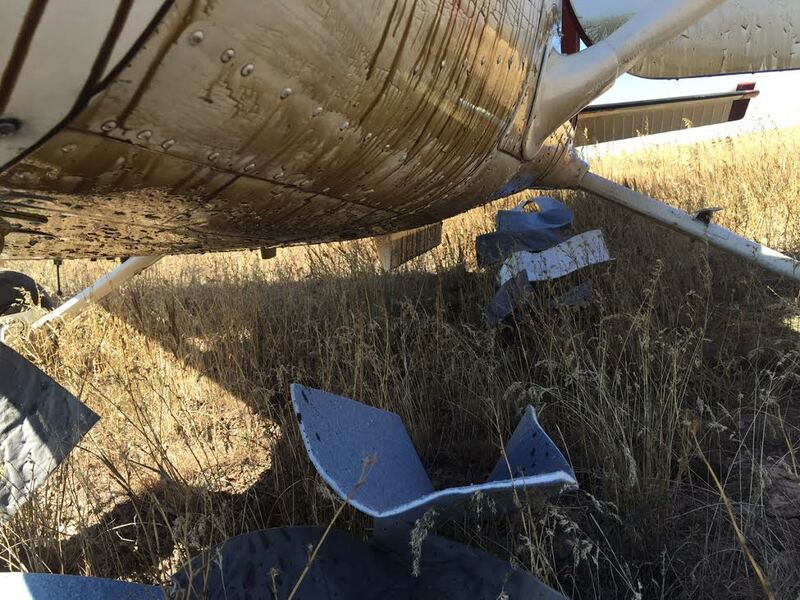 No evidence of pre-impact failure of the airframe, engine, or propeller was observed. Additional information regarding the wreckage can be found in the NTSB public docket for this accident. A segment of the ATC recording was provided to a flight instructor at Flying Start Aero who knew the accident pilot well; he was asked whether he could identify the person on the radio in the accident airplane. It was his determination that the person on the radio was his colleague, the accident pilot. According to the RNO ATCT personnel and position logs, at the time of the accident, there were 2 controllers on duty in the RNO ATCT. One controller was assigned to the local control position 1 (LC1) and the other was assigned to operational supervisor 1 (OS1) and ground control (GC) positions. Multiple position assignments for 1 individual during a work shift is normal operational practice. The LC1 controller was the individual who communicated with the accident airplane from the time the pilot contacted the RNO ATCT until the accident. According to an NTSB interview the LC1 controller began working for the FAA in July 2010, and transferred to the RNO ATCT in May 2015. He was qualified on all operating positions within the ATCT and was designated a controller in charge (CIC). The LC1 controller started his work shift at 1030, and ended it at 2300, for a total "on duty" time of 12 hours, 30 minutes. The Position Logs indicated that his "Position Duties" time was 5 hours, 16 minutes, and his "Non-Position Duties" time was 4 hours, 27 minutes. After returning from his second break period, the controller was assigned to the LC1 position, and about 21 minutes later, the accident pilot made his initial contact with RNO ATCT, with the LC1 controller. About 1744, when the accident airplane was about 35 miles south-southeast of RNO, the pilot checked on with NorCal approach control (NCT) and advised the LC1 controller that he had RNO ATIS information Juliet. The LC1 controller asked for the pilot's runway preference, and the pilot stated that he wanted runway 25. About 1751, the NCT controller issued a heading vector of 350°, and restricted the minimum altitude to 8,500 ft. The NCT controller advised the pilot to expect runway 25. At that time, the airplane's flight track was approximately perpendicular to, and about 7 miles east of, runway 25; this position and heading were consistent with a wide left base leg for runway 25. About 1754, the NCT controller advised the pilot that there would be a "slight delay for runway 25," that he was "number four now for the airport," and advised that "traffic on a fifteen mile straight in is a Boeing seven fifty seven for one-six right." The pilot acknowledged, and advised the NCT controller that he could accept runway 16L. The NCT controller advised the pilot of N958CA to "proceed to the downwind" and contact RNO ATCT. The NCT controller did not specify which runway he was referring to, and the pilot did not ask or specify which runway that downwind assignment was for. About 1754:33 the pilot contacted the RNO LC1 controller and transmitted "Reno tower good afternoon, Bonanza niner eight five charlie alpha restricted heading three-five-zero, eight thousand five hundred." About 1754:42, the NCT controller contacted the RNO LC1 controller via an interfacility landline to advise him that the pilot could accept runway 16L. The NCT controller stated that the airplane was being sent to "the downwind," but again the NCT controller did not specify which runway he was referring to, and the RNO LC1 controller did not ask or specify which runway that downwind assignment was for. About 1754:50, the RNO local controller responded to the accident airplane pilot, and instructed the pilot to continue inbound for runway 25. The pilot acknowledged with the response "continue inbound for two five…". At that time, the airplane was at an altitude of about 8,600 ft, about 7.6 miles southeast of the runway 25 threshold. The airplane position and heading were consistent with it being on a left base leg for runway 25, about 3.5 miles south of a 6.5 mile final approach leg. About 1755:08, an unidentified transmission consistent with those from the accident airplane queried "and ah tower, how about the restrictions?" The LC1 controller only partially heard this transmission, did not know which airplane it was from, did not acknowledge the communication, and did not request either a repeat or clarification of the transmission. The pilot did not repeat that transmission or transmit any related inquiries. Instead, the LC1 controller cleared a FedEx B757 to land on runway 16R and advised the FedEx pilots that their traffic was another B757 on a 5 mile final for the same runway. The LC1 controller never explicitly cancelled the NCT-assigned altitude and heading restriction, and never assigned any other heading or altitude to the accident airplane. About 1756:20, the accident pilot reported that he was on a "wide downwind" for runway 16L, to which the RNO LC1 controller replied "Bonanza five charlie alpha roger continue inbound for one six left." At that time, the airplane was about 7 miles east of runway 16L. It had already crossed through the extended centerline of runway 25, and was on a track of about 350°, at an altitude of 8,600 ft.
About 1757:12, the pilot transmitted "And tower five charlie alpha is turning a wide left base one six left." At that time, the airplane was about 7 miles east-northeast of RNO, and descending through 8,000 ft. The RNO controller responded with "…roger traffic niner mile final for one six right is a Boeing seven fifty seven, caution wake turbulence wind two six zero at one three gust one eight runway one six left cleared to land." The pilot acknowledged the landing clearance and reported that he did not have the traffic in sight. The LC1 controller only told the accident pilot about a FedEx B757, which was about 7 miles in trail behind a UPS B757. At that point, the accident airplane was approximately north-northwest bound, and the FedEx B757 was about 10 miles out in front of the accident airplane; it was traveling southbound, aligned on its inbound final approach course, and about 10 miles from the runway 16R threshold. The UPS B757 was about 3 miles from the runway 16R threshold. 1758:17, when the accident airplane was about 6 miles northeast of RNO, just after turning from west to southwest, and descending through 6,300 ft, the pilot advised that he had "the airliner" in sight. At that point, the UPS B757 was on about a 3/4 mile final to runway 16R, about 4.5 miles directly ahead of, and 1,700 ft below, the accident airplane. At that same time, the still-southbound FedEx B757 was about 5.3 miles from the accident airplane, at it's 2 to 3 o'clock position, and about 100 ft lower than the accident airplane. The LC1 controller was not required to verify that the accident pilot had correctly identified his traffic, and the LC1 controller did not respond to the accident pilot. Instead, the LC1 controller radioed "FedEx thirteen fifty nine traffic on a four mile left base for one six left six thousand two hundred feet, Bonanza, they do have you in sight." About the same time that the pilot reported visual contact with "the airliner," the accident airplane rolled out onto a diagonal base leg towards runway 16L, and continued its descent. By about 1758:45, while the accident airplane was inbound on the diagonal base leg, the UPS B757 had landed, and was being given taxi instructions by the LC1controller. Aside from the controller's 1758:53 "all aircraft" advisory that ATIS information Kilo was current, there were no communications to or from the accident airplane subsequent to the pilot's report that he had the "airliner" in sight. About 1800:21, when it was at an altitude of about 4,900 ft, the accident airplane joined an abbreviated base leg situated about 1 mile north of the runway 16L threshold. At that point, the FedEx B757 was just over 1 mile from the accident airplane, at it's 12 to 1 o'clock position, and about 200 ft lower. About 24 seconds later, at an altitude of about 4,700 ft, the accident airplane began its left turn onto final for runway 16L. At that point, the FedEx B757 was about 1 mile from the accident airplane, approximately at it's 10 to 11 o'clock position, still about 200 ft lower. The last radar return from the accident airplane was recorded at 1800:59, when it was at a radar-indicated altitude of 4,600 ft, and about 1/2 mile north of the runway 16L threshold. FAA document JO 7110.65W "Air Traffic Control" delineates nearly all the air traffic controllers' procedures and responsibilities; it is often referred to as "the controllers' handbook." According to JO 7110.65W Section 2-1-1 (ATC SERVICE), the "primary purpose of the ATC system is to prevent a collision between aircraft… and to provide a safe, orderly and expeditious flow of traffic..." The document also stated that in addition to its primary function, the ATC system has the capability to provide additional services, with "certain limitations," limited by "many factors," including traffic volume, frequency congestion, controller workload, and higher priority duties. Regarding the provision of those additional services, the document stated that those "services cannot be provided in cases in which the provision of services is precluded by" the cited factors. Conversely, the document also stated that "controllers must provide additional service procedures to the extent permitted by higher priority duties and other circumstances. The provision of additional services is not optional on the part of the controller, but rather is required when the work situation permits." Per the above guidance, the LC1 controller's primary responsibility was traffic separation for collision-avoidance purposes. Separation of traffic for wake vortex avoidance purposes was also the LC1 controller's responsibility, and the guidance explicitly delineated the applicable criteria, procedures and separation minima for both collision and wake vortex avoidance. The guidance differentiated these criteria and procedures as a function of the operating airspace category; RNO was categorized as Class C airspace. JO 7110.65W Section 2-1-2 (DUTY PRIORITY) guidance for ATC services in Class C airspace stated: "Give first priority to separating aircraft and issuing safety alerts as required in this order. Good judgment must be used in prioritizing all other provisions of this order based on the requirements of the situation at hand." JO 7110.65W specified that when simultaneously handling both instrument flight rules (IFR) aircraft (such as the B757s) and VFR aircraft (such as the accident airplane), the controller could transfer the separation responsibilities to the VFR aircraft once the controller ascertained that the required radar separation minima had been met, and that the visual separation criteria were or could be met. JO 7110.65W required that unless and until separation responsibilities were explicitly transferred from the controller to the VFR aircraft, the controller was responsible for ensuring that the minimum required distance between the IFR aircraft and the following VFR aircraft was maintained. When the controller first advised the accident pilot of the (FedEx) B757, the two airplanes were just over 9 miles apart. When the pilot erroneously advised that he had the controller-cited traffic in sight, the two airplanes were about 5.2 miles apart. That distance, the existing flight visibility, and the controller's knowledge and expectations of the airplanes' flight paths to the two parallel runways satisfied the requirements to permit the controller to transfer separation responsibilities to the accident pilot. Although the controller ceased providing separation services to the accident airplane after the pilot reported the traffic in sight, the controller did not explicitly transfer that separation responsibility to the pilot by any verbal instructions. JO 7110.65W Section 2-1-20 (WAKE TURBULENCE CAUTIONARY ADVISORIES) presented the controller responsibilities regarding these advisories. The guidance applied to arriving VFR aircraft that were not being radar vectored but were behind larger aircraft that require wake turbulence separation. The guidance required controllers to issue wake turbulence cautionary advisories "including the position, altitude if known, and direction of flight" to "VFR arriving aircraft that have previously been radar vectored and the vectoring has been discontinued." The guidance also stated "Issue cautionary information to any aircraft if in your opinion, wake turbulence may have an adverse effect on it." The guidance did not include any information regarding the quantity or frequency of such wake turbulence advisories, nor did it include any other amplifying guidance regarding those advisories. The Section then cited Advisory Circular 90-23 as an additional reference. FAA air traffic controller guidance for wake turbulence avoidance related aircraft separation distances was published in the JO 7110.65W. The separation distances are based upon the weight classes of the aircraft involved. Appendix A (Pilot/Controller Glossary) specified the following weight classes for "the purposes of Wake Turbulence Separation Minima." a) Super - The Airbus A-380-800 (A388) and the Antonov An-225 (A225) are classified as super. b) Heavy - Aircraft capable of takeoff weights of 300,000 pounds or more whether or not they are operating at this weight during a particular phase of flight. c) Large - Aircraft of more than 41,000 pounds, maximum certificated takeoff weight, up to but not including 300,000 pounds. d) Small - Aircraft of 41,000 pounds or less maximum certificated takeoff weight. The Appendix then referred the reader to the FAA Aeronautical Information Manual. The wake turbulence minimum separation distances are specified in Section 5-5-4 of JO 7110.65W. That guidance stated that operations on parallel runways less than 2,500 ft apart should be considered as a single runway, and that the minimum separation distance between a small aircraft (such as the accident airplane) behind a large aircraft (such as the B757s) is 4 nm. In June 2009, the FAA published Notice NJO 7110.504 with the stated subject of "Boeing 757-200 Weight Class." That Notice specified that for wake turbulence avoidance purposes, the minimum separation distance between a following aircraft with a maximum takeoff weight of 41,000 lbs or less and B757-200 airplanes was 5 nm. Notice NJO 7110.504 expired in February 2010. In February 2010, the FAA published Notice NJO 7110.519, which was cited as a "continuation" of Notice NJO 7110.504, and contained the same information, including the 5 nm minimum separation distance between "Small" class aircraft and B757 airplanes. Notice NJO 7110.519 expired in February 2011 and was not re-issued as another NJO Notice. The 5-mile separation was not integrated into the then-current or subsequent versions of the JO 7110.65. The investigation was unable to determine the reasons for this change in minimum B757 following distances. Much of the following information was derived from a telephonic interview of the LC1 controller, which was conducted by the NTSB-led ATC group about 3 weeks after the accident. During the accident pilot's initial transmission to RNO ATCT, the LC1 controller was coordinating with the RNO ground controller (GC), and therefore did not immediately respond to the accident pilot. The controller observed that the airplane data block scratchpad on his tower display workstation (TDW) indicated that the airplane was being sequenced for runway 25 by NCT. The TDW was a slaved radar display from NCT to the RNO ATCT. About 90 seconds after he was instructed to continue for runway 25, the pilot transmitted that he was on a downwind for runway 16L, and the controller did not discuss or counter the pilot's independent change of landing runway. The controller's interview did not provide any reasons for his unchallenging acceptance of the pilot's landing runway decision. Although there were two B757 airplanes on final approach for runway 16R, the controller stated that he did not consider the leading (UPS) B757 to be a factor for the accident airplane, and therefore did not advise the pilot of the fact that there were two B757s on final for runway 16R. The controller expected both B757s to land prior to the accident airplane. When the pilot advised the controller that he had the "airliner" in sight, the controller was confident that the pilot had properly identified the FedEx B757, and not the UPS B757, as his traffic. The controller stated that his rationale for his certainty was that because the FedEx B757 could not have traversed the 9 miles to the runway 16R threshold in the minute or so between the controller's traffic advisory and the pilot's sighting acknowledgement, the pilot must be viewing and referring to the FedEx B757. The controller also stated that if he believed that there was any confusion on the part of the accident pilot that the FedEx B757 was the traffic of concern, the controller would have advised the accident pilot that there were 2, and not just 1, B757 airplanes on approach to RNO runway 16R. Finally, although the controller intended for the accident airplane to land after the FedEx B757, the controller was uncertain as to whether the accident pilot was aware of his intentions regarding that sequence. Per the JO 7110.65W guidance, once the pilot (erroneously) reported that he had the controller-advised traffic in sight, the controller had 2 options regarding separation; the controller could either retain separation responsibility, or he could explicitly delegate that responsibility to the accident pilot by instructing the pilot to maintain visual separation. The controller did not accomplish either of those options. Instead, after the accident pilot's erroneous traffic sighting report, the controller advised the FedEx B757 that the accident airplane had the B757 in sight. In his post accident interview, the controller did not provide any reasons for his failure to accomplish one of the separation options. In his interview, the controller reported that he was aware that the wind and runway orientation would result in the FedEx B757 wake vortices traveling towards the accident airplane's flight path and landing runway. Despite his expectation of that wake vortex movement, the controller was not concerned because "runway 16L arrivals normally remained above the flight path of the B757s landing on runway 16R provided they had the other aircraft in sight." According to the controller's understanding of the current RNO ATCT procedures, the facility was permitted to sequence aircraft this way, and it was a normal practice. According to the controller, general aviation aircraft landing on runway 16L would avoid the wake vortices of heavier airplanes landing on runway 16R by altering their approach paths in order to remain above the heavier airplanes, and the general aviation airplanes would typically touch down on runway 16L about 2,000 to 3,000 ft down the runway. The pilot had reported the Amlodipine, Losartan, and Rosuvastatin to his Aviation Medical Examiner on his FAA medical certificate application, and he was issued an FAA medical certificate. Those 3 medications are not considered impairing. Naproxen is in a class of medications called non-steroidal anti-inflammatory drugs (NSAID), and its use is generally considered not to present a hazard to aviation safety. According to its website, "Flying Start Aero is a full-service flight school and aviation resource center" that specialized "in flight training from student pilot to Airline Transport Pilot." Flying Start Aero also offered "scenic-photo flight over Lake Tahoe and the surrounding points of interest." The web site stated that the Bonanza (the accident airplane) was "perfectly suited for commercial pilot training and/or fast and comfortable trips to faraway places for our renters." As of the date of the accident, Flying Start Aero did not hold an FAA Part 135 operating certificate, which would enable them to offer chartered transportation of passengers for hire. A common practice of flight schools or fixed base operators (FBOs) is to utilize systems of electronic or paper sign out/dispatch records to track the times that students or renters accrue on the aircraft. The information is then principally utilized for both billing and maintenance scheduling purposes. In response to an NTSB request for the accident airplane's dispatch records, the Flying Start Aero attorney stated that the "rental book records containing…copies of the dispatch [paperwork] of N985CA were in the aircraft at the time of the accident and destroyed in the fire." This attorney-cited practice of keeping the rental records onboard the airplane was not consistent with typical FBO business practices. 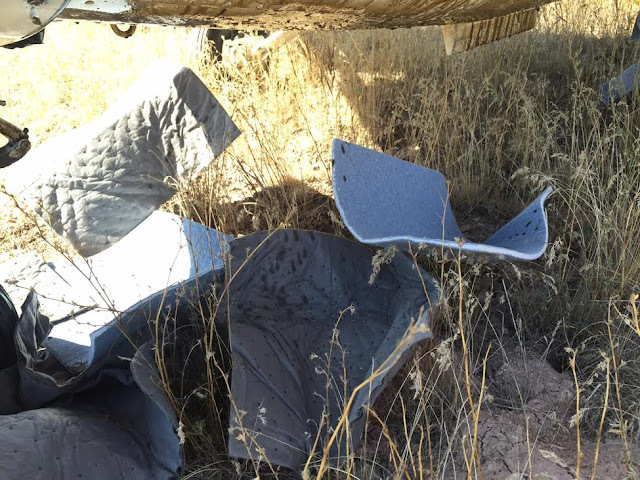 In addition, the attorney's response was dated September 21, 2016; as of that date, the wreckage had not been released by the investigation, and therefore neither Flying Start Aero nor its attorney had any access to, or any knowledge of, the recovered airplane components or contents. FAA regulations set the requirements and limitations for pilots and operators to be reimbursed for carrying passengers. Because Flying Start Aero did not hold a Part 135 operating certificate, any carriage of persons for compensation, for purposes other than flight instruction, must comply with either paragraph 91.146 and 91.147, which delineate the applicable requirements and limitations for such flights. Paragraph 91.146 permits limited operations for carriage of passengers for "charitable, non-profit, and community events." The guidance defines those events, and imposes strict limits in terms of calendar frequency, departure and landing airports, flight distance, and overflight areas. Specifically, the flight must be nonstop, begin and end at the same airport, and must be conducted within a 25-statute mile radius of that airport. There was no evidence that the accident flight was in support of any charitable, non-profit, or community event. In addition, the accident flight did not comply with the 91.146 airport or distance limitations. Paragraph 91.147 permits the carriage of persons for profit, but the flights are subjected to strict limitations, and the Operator must be granted a Letter of Authorization (LOA) by the FAA Flight Standards District Office (FSDO) "nearest [the operator's] principal place of business." That LOA would be very specific regarding the applicable conditions for those flights. In the case of Flying Start Aero, the nearest FSDO was Reno. Flying Start Aero had never applied for, and was never granted, any such LOA by the Reno FSDO. An FAR Part 135 operating certificate would have permitted Flying Start Aero to carry passengers for hire. For fatigue avoidance and flight safety reasons, FAR Part 135 specifies flight- and duty-time limits for pilots. FAR 135.265 imposed limits on planned flights to 1,200 hours in any calendar year, 120 hours in any calendar month, 34 hours in any 7 consecutive day, and 8 hours during any 24 consecutive hours for a flight crew consisting of one pilot. Although some initial information indicated that the flight was an instructional flight, and because Flying Start Aero did not hold a Part 135 certificate, the investigation attempted to determine the exact nature of the flight. The investigation found that, although the passenger who was the owner of the local company had taken one or two flight lessons the year before the accident, he did not posses an FAA student pilot certificate. Furthermore, the passenger who deplaned in HND stated that there did not appear to be any flight instruction occurring during the time that he was on board the airplane, and that the pilot conducted all activities associated with the operation of the airplane, including radio communications. In response to an NTSB inquiry, the Flying Start Aero attorney stated that he believed that company owner passenger "intended to become an active student" pilot, and that the flight was to be fully paid for by the passenger and/or his company. The attorney noted that subsequent to the accident, there was "never any billing" for the flight. The accident airplane owner's representative stated that the owner was normally not kept apprised of the airplane flight types or related payment specifics. Several subsequent inquiries to representatives of the passengers and the company the passengers worked for regarding the nature of the flight, and particularly how it was to be paid for, were not answered. Performance data from the Pilot's Operating Handbook (POH) indicated that for the ambient RNO conditions and a 17-knot headwind, the accident airplane would have required about 1,500 ft to land over a 50 foot obstacle. This distance represents about half of the available landing distance from the runway 25 threshold to the eastern edge of runway 16R. POH landing distance over a 50 foot obstacle for the ambient RNO conditions and no headwind was about 1,700 ft. A landing planned for 3,000 ft beyond the runway 16L threshold (as cited by the LC1 controller), which would be 1,000 ft beyond the estimated touchdown location of the FDX B757, would provide a runway distance margin of 4,700 ft.
correction, a hazardous landing condition may result. Therefore, the takeoff and landing capabilities with respect to the reported surface wind conditions and the available landing directions must be considered. Before an airplane is type certificated by the Federal Aviation Administration (FAA), it must be flight tested to…[demonstrate that it is]…satisfactorily controllable with no exceptional degree of skill or alertness on the part of the pilot in 90° crosswinds up to a velocity equal to 0.2 VSO. This means a windspeed of two-tenths of the airplane's stalling speed with power off and landing gear/flaps down. The AFH also stated that "It is imperative that pilots determine the maximum crosswind component of each airplane they fly, and avoid operations in wind conditions that exceed the capability of the airplane." The velocity of the crosswind component for which adequate control of the airplane during takeoff and landing was actually demonstrated during certification tests. The value shown is not limiting. Crosswind component calculations for a runway 16L landing using the reported wind directions and speeds yielded values that approached or exceeded the airplane's maximum demonstrated crosswind value. While the 1757:18 winds yielded a steady state crosswind component of about 13 knots, the gusts resulted in an approximate 18 knot crosswind component. The 1758:53 winds yielded a steady state crosswind component of about 17 knots, and gust crosswind component of about 20 knots. Wake Vortex information for pilots is presented in Advisory Circular (AC) 90-23G and Chapters 4 and 13 of the FAA Pilot's Handbook of Aeronautical Knowledge (PHAK, FAA-H8083-25). According to the PHAK, wing lift generation "triggers the rollup of the airflow aft of the wing resulting in swirling air masses trailing downstream of the wingtips. After the rollup is completed, the wake consists of two counter rotating cylindrical vortices." The strength of the vortex is governed by the weight, speed, and shape of the wing of the generating aircraft. The vortex characteristics of any given aircraft can also be changed by the extension of flaps or other wing configuration devices, as well as by a change in speed. The AC stated that the "vortices from an aircraft can pose a hazard to encountering aircraft. For instance, the wake of larger aircraft can impose rolling moments that exceed the roll control authority of smaller encountering aircraft." Wake vortices are rarely detectable visually, therefore the PHAK advised pilots to avoid wake vortex encounters by two principal means: separation by flight path, and separation by time. The AC stated that "Pilots must learn to envision the location and movements of the vortices generated by other aircraft and to adjust their flightpath accordingly." The guidance provided descriptions of vortex behavior, particularly with regard to vertical and lateral travel. The PHAK stated that "trailing vortices have certain behavioral characteristics that can help a pilot visualize the wake location and take avoidance precautions. The vortex circulation is outward, upward, and around the wingtips… Tests have shown that vortices remain spaced a bit less than a wingspan apart, drifting with the wind, at altitudes greater than a wingspan from the ground. Tests have also shown that the vortices sink at a rate of several hundred feet per minute, and once about 100 to 200 feet above the ground, they tend to move laterally at about 2 to 3 knots, away from the generating airplane centerline. Vortices slow their descent and diminish in strength with time and distance behind the generating aircraft." The guidance provided specific flight path strategies to avoid wake vortex encounters; the avoidance scheme was predicated on the subject airplane traversing a flight path that avoided the expected travel paths of the vortices. Both documents discussed the effects of crosswinds on vortex behavior, and that the vortices could be translated laterally by a crosswind. The Aeronautical Information Manual (AIM) is a pilot-oriented FAA "Official Guide to Basic Flight Information and ATC Procedures." Chapter 7 (Safety of Flight), Section 3 (Wake Turbulence) presents detailed information regarding wake vortex behavior, avoidance strategies for pilots, and details on ATC procedures for wake vortex avoidance. Section 7-3-9 of the AIM stated that "Because of the possible effects of wake turbulence, controllers are required to apply no less than specified minimum separation to all IFR aircraft, to all VFR aircraft receiving Class B or Class C airspace services when operating behind super or heavy aircraft, and to small aircraft operating behind a B757." Review of several recent editions of the AIM indicated that the specified separation distance for "small" aircraft (below 41,000 lbs MTOW) behind B757 aircraft has changed. The January 2015 edition specified a separation distance of 5 nm. The 2016 edition, current at the time of the accident, also specified a 5 nm separation distance. However, the October 2017 edition changed this B757 separation distance to 4 nm. The AIM did not contain any explanation of that change. AC90-23G "Aircraft Wake Turbulence," stated that ATC uses four aircraft weight classes for the purposes of wake turbulence separation minima; those classes are the same as specified in JO 7110.65W. However, unlike JO 7110.65W, the AC contained additional information specifically regarding the B757 in a note that stated "The Boeing B757 is classified as a Large, but special wake turbulence separation criteria apply." The AC specified that the minimum separation distance for small aircraft following behind B757 airplanes was 5 miles, which is a 1-mile increase from the separation required from other "Large" aircraft. This 5-mile distance is the same as that specified by the AIM that was current at the time of the accident. It is 1 mile greater than that specified in either the then-current JO 7110.65W or the October 2017 version of the AIM. The accident airplane flight path was analyzed to evaluate the possibilities of either an aerodynamic stall or a wake vortex encounter. Detailed results are documented in an Airplane Performance Study, available in the NTSB public docket for this accident. The accident airplane was not equipped with a flight data recorder. As a result, the study is based primarily on FAA ground tracking radar data. The study developed time histories of several key flight parameters, including body attitudes and angle of attack. The data depict that the approach into RNO was relatively smooth, with bank angles less than 20°, and sufficient airspeed and stall margins for the duration; there were no indications of an incipient or developed aerodynamic stall. The study revealed that wake turbulence from a FedEx B757 was a potential factor in the accident airplane's loss of control. The wake vortex modeling program used for the study estimated that the accident airplane flight path in time and space placed the accident airplane in the vicinity of both wake vortices generated by the FedEx B757 at a geographic location just prior to the ground impact site. On August 30, 2016, about 1801 Pacific daylight time, a Beechcraft A-36 Bonanza, N985CA, was destroyed when it impacted the ground in a recreational vehicle (RV) park about one-half mile prior to the threshold of runway 16L at Reno/Tahoe International Airport (RNO), Sparks, Nevada. The airplane was owned by Venture Aviation Services of Reno Nevada, and was on leaseback to, and operated by, Flying Start Aero, a flight school based at RNO. Both persons on board received fatal injuries, but no-one in the RV park was injured. The flight was conducted under the provisions of Title 14 Code of Federal Regulations Part 91. Visual meteorological conditions prevailed. According to a person who was a passenger ("Passenger 2" for clarity) on some of the airplane legs that day, the plan was for the pilot to depart RNO with two passengers, pick up a third passenger in Las Vegas, Nevada, and continue on to southern California, where the three passengers were to attend a business meeting. Later that day, they planned to reverse that sequence, with the airplane, pilot, and two passengers returning to RNO in the late afternoon or early evening. All three passengers were employees of the same woodworking company, which was based near RNO. For reference purposes, the company owner will be referred to as "Passenger 1," and the passenger who boarded in Las Vegas as "Passenger 3." According to Passenger 2, he was advised that the pilot wanted to be "wheels up" at 0410 on the morning of the trip. He and Passenger 1 arrived at the Atlantic Aviation facility at RNO at 0350; the pilot was already there, and they proceeded to board the airplane. Passenger 1 sat in the right front seat, and Passenger 2 sat in the right-side, aft-facing seat. Passenger 2 was not a pilot, and had no flight training experience. He reported that he believed that Passenger 1 was a student of the pilot, as was the son of Passenger 1. Passenger 2 reported that the flight departed RNO about 0410, and landed at Henderson Executive Airport (HND), Las Vegas, Nevada, sometime after 0600. That flight leg was smooth and uneventful. HND records indicated that the airplane took on 30 gallons of fuel sometime between 0624 and 0647. Passenger 2 reported that Passenger 1 moved to the aft cabin, and Passenger 3 took the right front seat. The airplane departed HND, and landed at French Valley Airport (F70), Murrieta/Temecula, California sometime after 0900. The three passengers then left the airport by car for their business meeting, and returned about 1300. Passenger 2 did not know what the pilot did during the intervening hours. The three passengers then re-boarded the airplane for the flight to HND, with the same seating arrangement as the leg down from HND. That trip leg was very bumpy, and Passenger 2, who was not comfortable in small airplanes, described himself as "tense" for the trip. Observing this, Passenger 1 suggested that Passenger 2 deplane at HND with Passenger 3, and that he take a commercial flight to RNO. Passenger 2 observed the refueling of the airplane, and then decided not to accompany the pilot and Passenger 1 to RNO; he left HND before the two boarded the airplane, and therefore did not observe their preparations or seating arrangement. According to another flight instructor at Flying Start, the pilot had called and reported that his passengers were running late, and that he would return to RNO later than planned. According to HND records, the airplane was "topped off" with 24.3 gallons of fuel sometime between 1520 and 1530. Preliminary air traffic control and ground tracking radar information indicated that the flight was conducted under visual flight rules, and the pilot first contacted the RNO air traffic control tower (ATCT) about 1754:35; at that time the Bonanza was about 9 miles southeast of RNO at 8,500 feet, and on an assigned heading of approximately north. About 2 minutes later, the pilot reported that he was on a "wide downwind" for runway 16L, and was instructed to "continue inbound." At 1757:13, when the Bonanza was about 7 miles east-northeast of RNO, the pilot radioed that he was turning a "wide left base" for 16L. The ATCT radioed that his traffic was a B-757 on a 9 mile final for 16R, that the winds were 260 at 13, gusting to 18 knots, and that he was cleared to land. Although the controller did not specify it, the Bonanza's traffic was a FedEx B-757, which was about 5 miles in trail behind a UPS B-757, also on final for 16R. The pilot responded that he did not have the traffic in sight. About 1 minute later, when the Bonanza was about 5 miles northeast of RNO and descending through 8,000 feet, the pilot advised that he had "the airliner" in sight. At that time, the UPS B-757 was on about a half-mile final to 16R, and the FedEx B-757 was about 6 miles from 16R. About the same time as the pilot reported visual contact with the "airliner," the Bonanza began a dogleg (diagonal) base leg towards 16L, and continued its descent. The Bonanza then joined an abbreviated, perpendicular base leg about 1 mile from 16L, and then turned onto final. The last radar return from the Bonanza was recorded at 1800:59, when the airplane was at a radar-indicated altitude of 4,600 feet, and about 1/2 mile north of the 16L threshold. According to multiple eyewitnesses, the Bonanza appeared to be approaching RNO normally, without any unusual sounds or dynamics, or any smoke or other outward signs of distress. Just as the airplane was over the RV park, it rapidly rolled inverted, and descended to the ground. Ground scar and debris information was consistent with a near-vertical descent. The airframe and engine exhibited significant impact disruption, and were also significantly damaged or consumed by the post-impact fire. Examination of the remaining wreckage did not reveal any pre-impact failures or deficiencies. 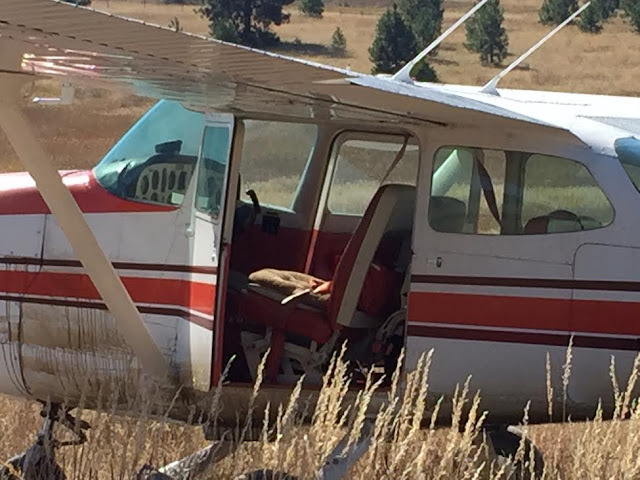 Federal Aviation Administration (FAA) information indicated that the 73 year old pilot held commercial and flight instructor certificates with airplane single engine and instrument ratings. He reported a total flight experience of 11,100 hours on his most recent application for an FAA third-class medical certificate, which was issued in March 2016. FAA information indicated that the airplane was manufactured in 1981, and was equipped with a Continental Motors IO-550 series engine. The most recent annual inspection was completed in November 2015. The 1755 RNO automated weather observation included winds from 290 degrees at 17 knots, gusting to 20 knots, visibility 10 miles, few clouds at 10,000 ft above ground level, temperature 31 degrees C, dew point minus 5 degrees C, and an altimeter setting of 30.01 inches of mercury. Flying Start Aero owner John Brown in the cockpit of his airplane in 2005. Former Minden flight instructor John B. Brown was killed in an aircraft crash in Sparks on Tuesday. John B. Brown, 73, was identified as the pilot of the aircraft that crashed into a recreational vehicle while on approach. 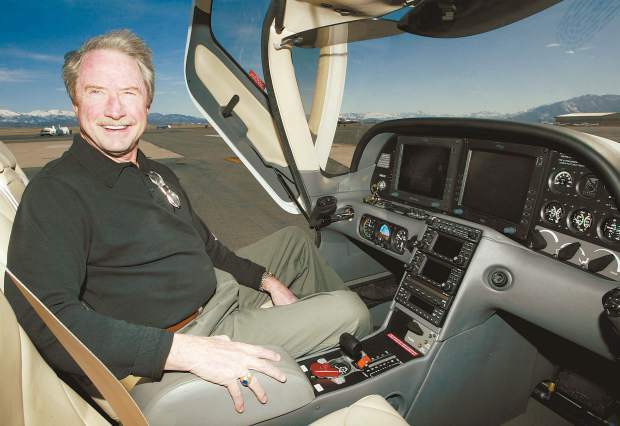 Brown was the owner of Flying Start Aero, which had an outlet at Minden-Tahoe Airport until four years ago. The Beech A36 Brown was flying was owned by Venture Aviation Services, according to the Federal Aviation Administration. 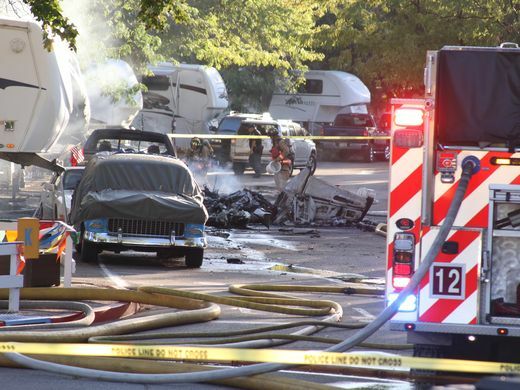 The aircraft caught fire, killing Brown and passenger James Elliker, 50, of Sparks. Brown sold the Minden location in January 2012 after nearly 13 years. He opened the business Sept. 10, 1999, according to an R-C feature. He got his wings after graduating from high school. He worked in the pharmaceuticals industry for companies including Johnson and Johnson and Smithkline Beacham before he retired in his early 50s. He went to flight school in Oregon and was certified in commercial, instrumental and flight instruction. 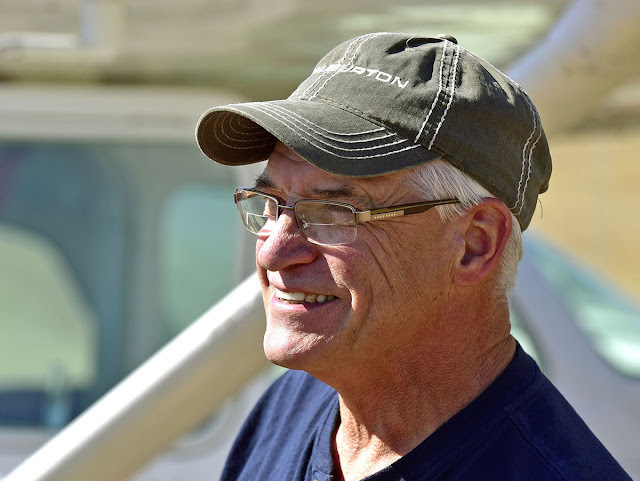 He worked at Minden-Tahoe as a flight instructor for three years teaching with NIFTI and Hutt Aviation before opening Flying Start with partner Mark Garic and FAA-certified mechanic Jim Crozier. "Victory Woodworks is saddened by the loss of Jim Elliker. 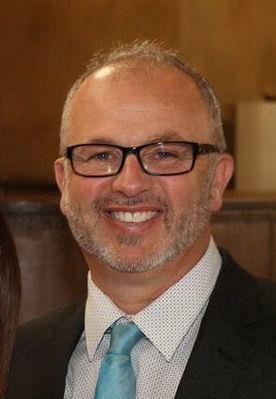 Jim worked tirelessly to build up his family, employees, customers and everyone he met. As we move forward, we will always remember his passion and commitment to excellence with our valued employees, clients, colleagues and vendors. Victory Woodworks will forever be dedicated to Jim's vision and culture of the company and will honor his legacy by continuing forward and uninterrupted with its business." Elliker, 50, a longtime local, husband, and father of four was one of two people who died when a single-engine plane crashed in Sparks. Company Vice President Luke Burke says he was supposed to be on that plane as well, but sensing his uneasiness with the turbulence on the first leg of the flight, Elliker told him to get off and take a commercial flight home. "There is no doubt that he saved my life," Burke said. "That's how much he cared about people in general. He was an amazing man; a fantastic husband, great friend, wonderful father and liked by nearly all who met him." A fund in Elliker's name has been established at the Kids Kottage in Reno. Burke says it’s a local organization that was always important to Elliker, who was known for giving back to a community he always said gave him so much. Burke says Victory Woodworks is run like a family business. The company employs about a hundred people and while they are grieving, they also know that Elliker would want them to keep on working. "Jim had a succession plan and we've began executing that," Burke said. "We have the best team of people working here, doing what they do best to keep up moving forward." He says many employees have worked there more than a decade and many clients were longstanding ones. "Jim always said that we don't have a lot of clients; we have a lot of repeat clients." The pilot of the Beechcraft aircraft that went down has been identified as 73-year-old John Brown. The NTSB has taken over the crash investigation. 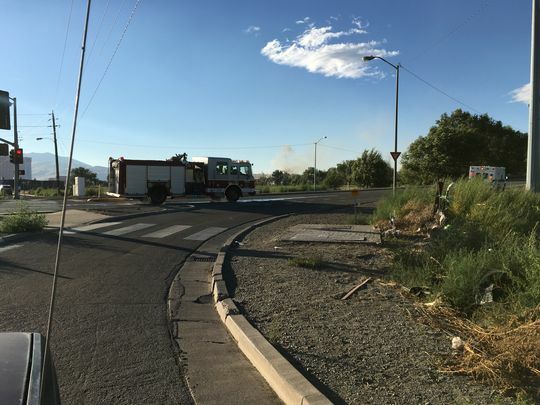 SPARKS, Nev. (News 4 & Fox 11) — The Washoe County Coroner’s office has confirmed that two people died in a small plane crash at a Sparks trailer park on Rock Boulevard on Tuesday evening. A spokesperson says the pilot and a passenger of the plane both died after the plane crashed into the Rivers Edge RV Park. The pilot has been identified as 73-year-old John Brown. The identity of the passenger is being withheld until next of kin has been notified. 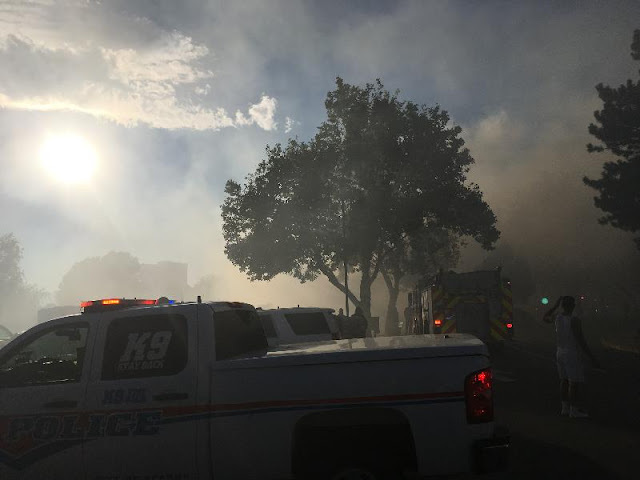 The crash, reported at about 6:15 p.m. sparked a fire at the Rivers Edge RV Park, prompting a response from several area agencies, including Sparks Fire, Truckee Meadows Fire, Reno Fire and law enforcement. One witness to the crash told News 4-Fox 11 via phone that it sounded as if the plane's engine had stalled. Several witnesses described seeing the plane appear to lose control before crashing. Sparks Fire Marshal Bob King said the plane appeared to be making a landing into Reno-Tahoe International Airport when it crashed for an unknown reason. Crews arrived on scene and put out the fire, then proceeded to evacuate residents, King said. The plane crashed into asphalt in the park, police said. No trailers or cars were struck in the impact, though a few were damaged, likely from debris. Nobody in the trailer park reported any injuries. In a press briefing Tuesday night, representatives from Sparks Police Department and the Reno-Tahoe Airport Authority said they could not provide any information on the person or persons inside the plane, citing an impending investigation from the National Transportation Safety Board. Brian Kulpin with the Reno-Tahoe Airport Authority said officials were working with the Federal Aviation Administration (FAA) and the NTSB on the investigation into the crash, where the plane came from and who owned it. An FAA spokesman said in an email that it was a single-engine Beechcraft A36 inbound to Reno that crashed. The circumstances of the crash remain unknown. The NTSB was on scene Wednesday, where one member confirmed that two people in the plane died in the crash. Residents were evacuated from the trailer park. 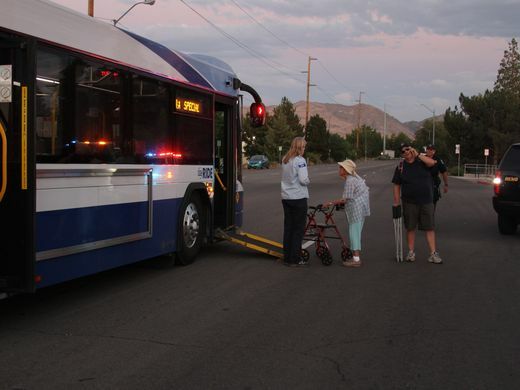 RTC provided a bus equipped with air conditioning for any residents who needed temporary shelter. Emergency medical and animal services were also on scene to provide any assistance needed. The Nugget Casino Resort is providing accommodations for residents who have been displaced, authorities said Tuesday night. Authorities said most residents could return home; 18 trailers remain uninhabitable because of either damage or because they are part of the investigation area. 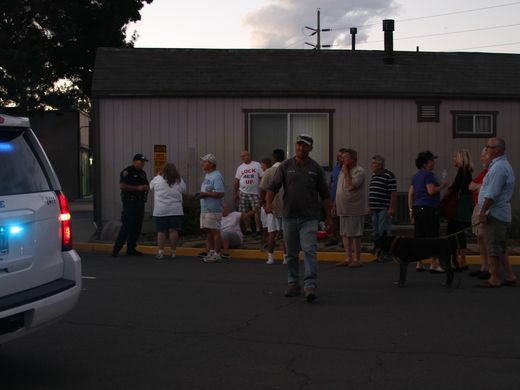 The Northern Nevada Red Cross is assisting those who have been displaced as a result of the crash and investigation. Authorities are letting them come to the RV park to collect any belongings they need. SPARKS, Nev. – A small plane that crashed into a northern Nevada recreational vehicle park, killing both people on board, plunged nose-first close to occupied RVs — and no one on the ground was hurt, authorities said Wednesday. The single-engine Beechcraft A36 crashed in the city of Sparks, about a half-mile from a runway at Reno-Tahoe International Airport. 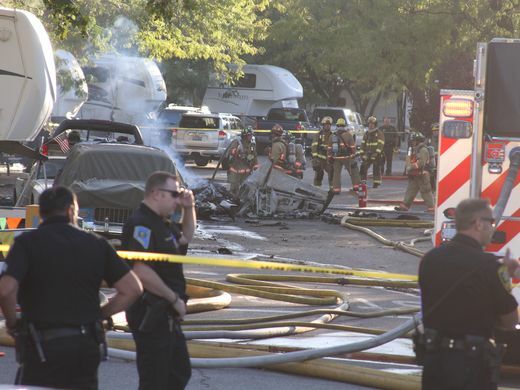 The crash caused a fire that damaged several RVs and vehicles, said Sparks police Lt. Pete Krall. But people in nearby RVs escaped uninjured. 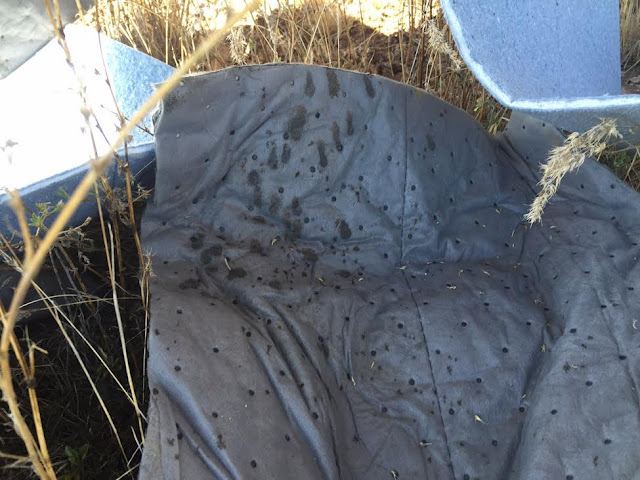 "There was a potential for a really catastrophic event," Krall said. "The fact it wasn't worse was really very lucky." 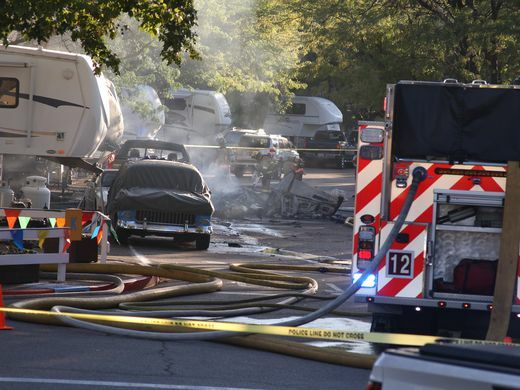 Firefighters evacuated the 164-space trailer park following the 6:15 p.m. Tuesday crash because of smoke from the fire. Authorities said later that everyone on the ground had been accounted for. The crash was being investigated by the National Transportation Safety Board. 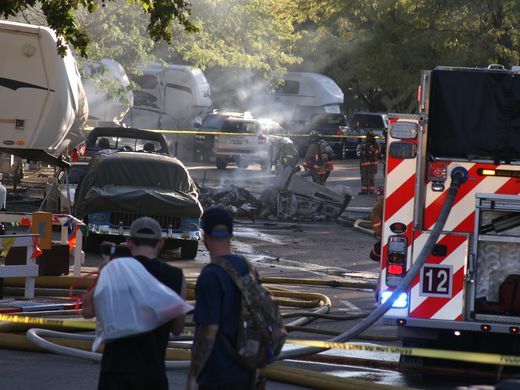 Preliminary findings will be made public in about 10 days, said NTSB spokesman Eric Weiss. The identities of the victims were not made public Wednesday by the Washoe County coroner's office. The 1981 Beechcraft was registered to Venture Aviation Services in Reno, according to a Federal Aviation Administration database. Calls to people listed in state records as connected to the company went to an apparent fax line and to a disconnected number. The Rivers Edge RV park hugs the Truckee River just north of the airport and is owned by Storz Management Co. in Orangeville, California. 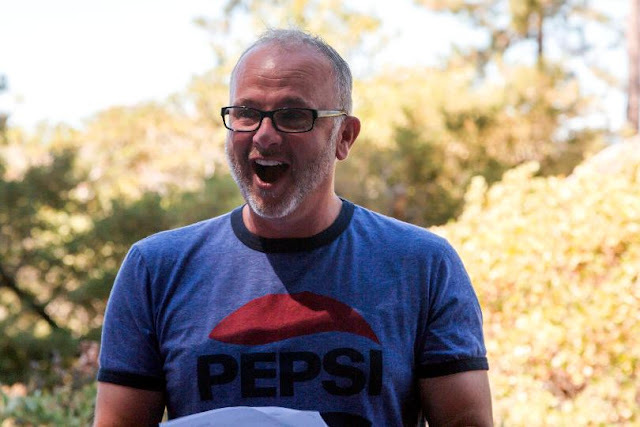 Andy Carey, the company's president, declined to comment. Online reviews about the RV park warn first-time visitors about low-flying commercial aircraft. The airport is served by seven airlines and several air cargo companies. 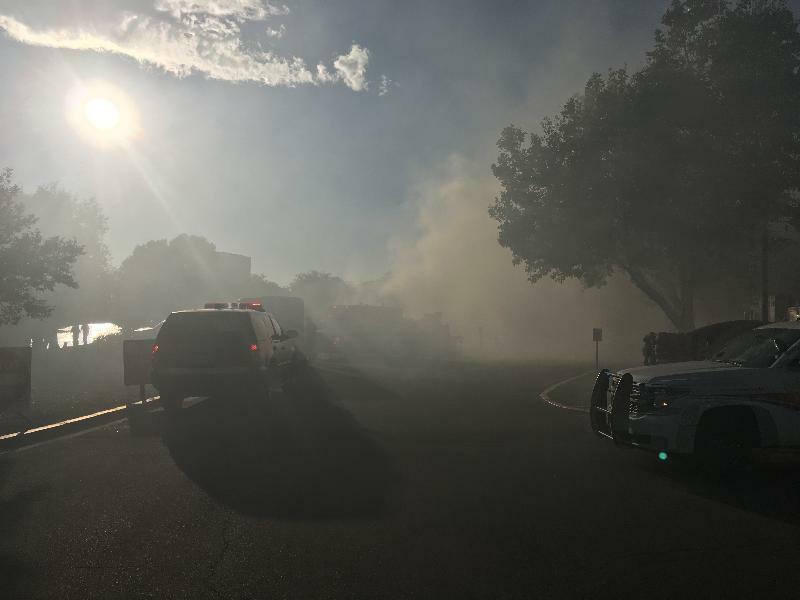 A small plane crashed and erupted into flames at the River's Edge RV Park in Sparks Tuesday night. It happened around 6:00 p.m. near Rock Park. The FAA reports the single-engine Beechcraft A36 was inbound to Reno when it crashed under unknown circumstances. Authorities say there are no injuries that have been reported and everyone has been accounted for on the ground. The occupants of the aircraft are still unknown. They say there was a popping of propane in the RV park and at this time, all of River's Edge RV Park has been evacuated. The condition of the pilot or anyone else who may have been on board is unclear, but there were no injuries on the ground. Residents have been able to return to their homes and emergency crews have left for the night as investigators remain on scene investigating the crash. 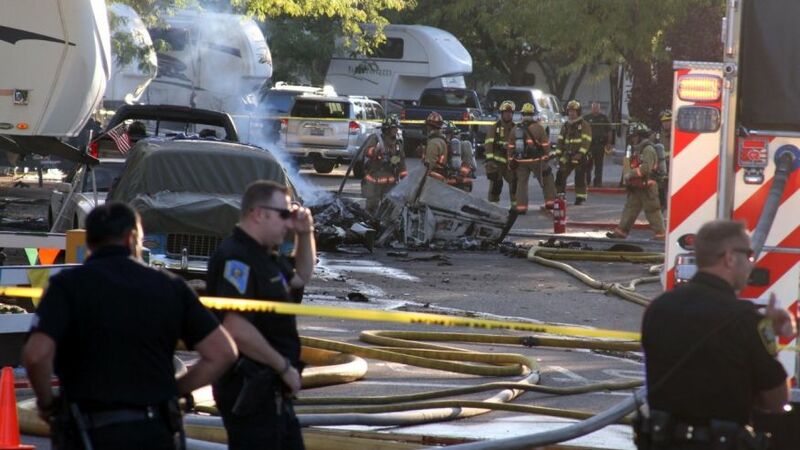 Greta Woyciehowsky, with the Sparks Police Department said, "The plane nose-dived into the asphalt just next to the vehicles and the trailer. It didn't strike it." A single-engine Beechcraft instantly broke out into flames when it crashed. Bob Smith, a resident said, "There was an engine that sounded like it was having a real struggle. And then there was this huge boom." Dennis Jordan, who also lives at the River's Edge RV Park adds, "I thought that I heard the airplane and everything just happened so fast. There was fire going up the street and down the street and a lot of smoke." Residents quickly evacuated the area after shrapnel damaged several trailers and cars. 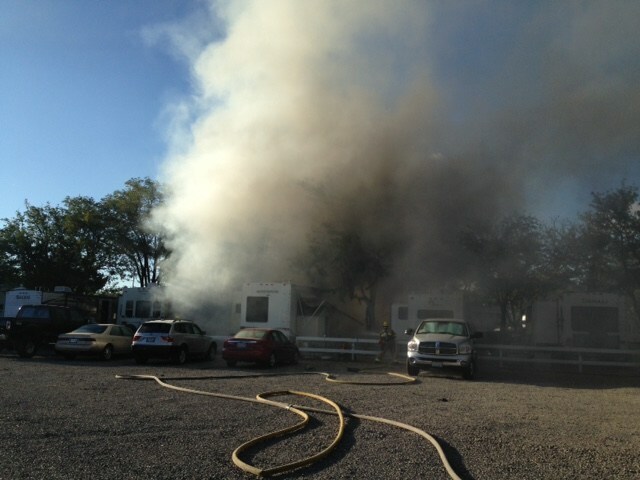 The fire also started to spread in the RV park. In the chaotic moment, one witness described a dangerous scene. Jeremy Twitt said, "There was a lot of pandemonium. Craziest thing was watching the people run back in to get their stuff into the flaming fifth wheels." Emergency responders were doing their best to get bystanders out of and away from the propane tanks possibly exploding. Police say ultimately everyone on the ground walked away safely. "A lot of them here are long-term residents. Some of them for many many years. 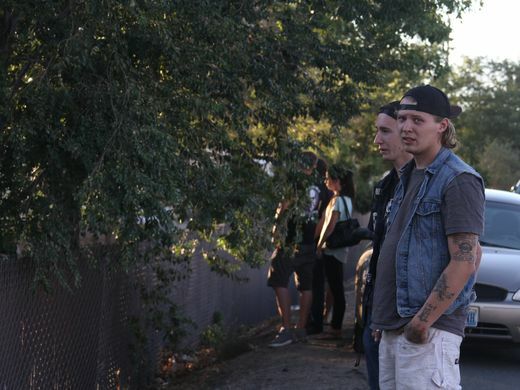 These are their homes to them," said Woyciehowsky. Jordan adds, "Everybody in the trailers got out. I've seen all my neighbors, so I'm happy about that." Sanford Friedlander witnessed the whole ordeal from the Reno-Tahoe International Airport, where officials say the plane was inbound to land. "It looked like it was flying normally for a moment, then it sort of just flipped vertically and went straight into the ground. Then a big fireball. And a big cloud of black smoke," said Friedlander. Authorities still haven't released the condition or identity of the pilot or anyone else who may have been on board. "Until those families are notified, I don't think we're going to be releasing any more information and we hope it's soon. We're in contact with the coroners office and they usually handle that," said Woyciehowsky. The National Transportation Safety Board will be talking over the investigation to find out more about this plane crash. Resident of Rivers Edge are being let back into their homes as of 10 p.m. Tuesday night. 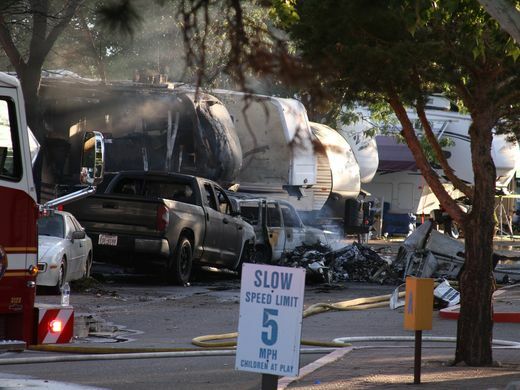 An airplane crashed into an RV park on Thursday afternoon in Sparks as it approached the airport. 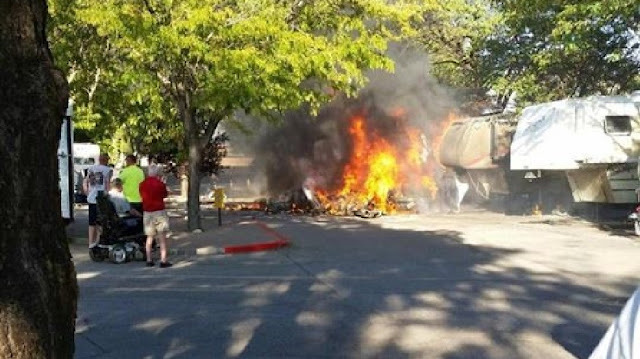 On Tuesday at approximately 6:15 p.m., a small airplane nose-dived and crashed into the Rivers Edge RV Park as it approached the Reno-Tahoe International Airport, Sparks Fire Department officials said. The RV park is located on Rock Boulevard in Sparks. 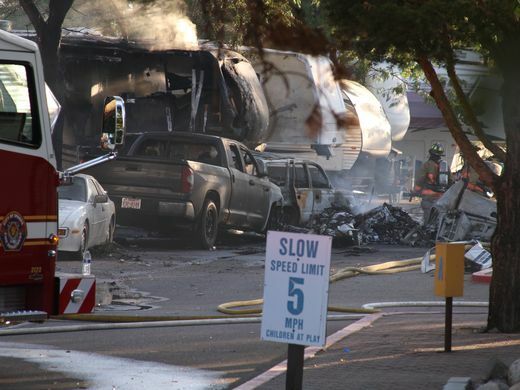 There were no injuries reported by residents of the RV park. However, the condition of the pilot or anyone else who may have been on the airplane is unknown. According to Sparks Fire Department fire marshal Bob King, the airplane did not hit any RV's when it crashed. 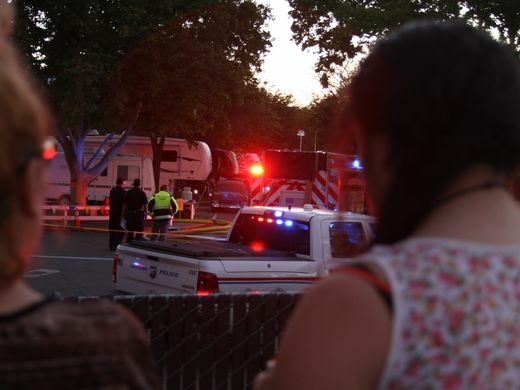 "There was some pretty significant damage to a couple of trailers and some vehicles there," Lieutenant Greta Woyciehowsky from the Sparks Police Department said. "We later learned that the plane nosedived into the asphalt just next to the vehicles there but didn't strike it. Probably some shrapnel and other things hit the trailers." The Reno-Tahoe International Airport is working with the Federal Aviation Administration and the National Transportation Safety Board to determine where the airplane was coming from and whether it was a private aircraft, vice president of Marketing and and Public Affairs for the Reno-Tahoe Airport Authority Brian Kulpin said. The investigation by the FAA is ongoing. Residents of the park were evacuated and the American Red Cross is at the scene helping them. 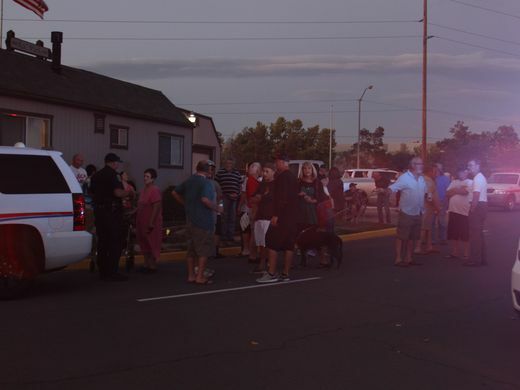 According to Reno Police Department officials, residents are allowed to go back into the park to quickly retrieve only pets and medication. An RTC bus arrived to help transport the displaced residents. 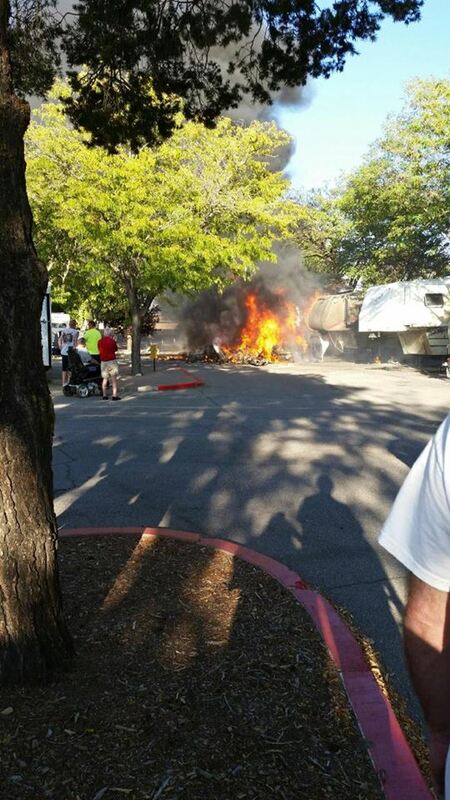 Officials say a small plane crashed into an RV park as it approached Reno-Tahoe International Airport. The condition of the pilot or anyone else who may have been aboard is unclear, but there were no injuries on the ground. 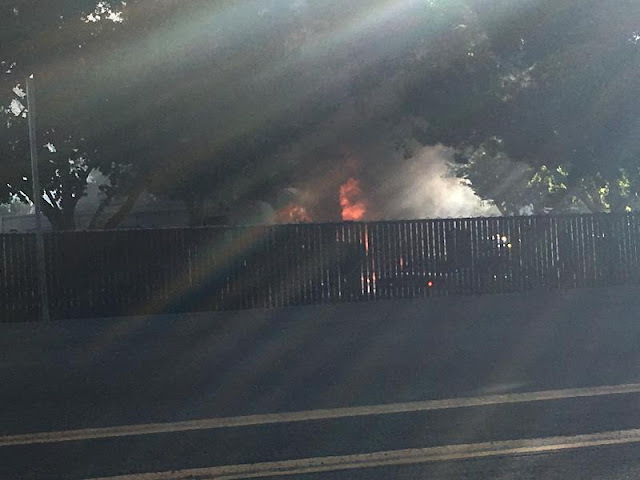 Sparks police say the plane hit the ground nose first and caught fire. Some of the wreckage hit trailers and vehicles. Sparks fire officials say everyone in the RV park has been accounted for and no one was hurt. The park has been evacuated because of smoke. Red Cross officials are on the scene to help out evacuees. As 8:03 p.m., traffic was opening back up on Rock Boulevard, officials said. 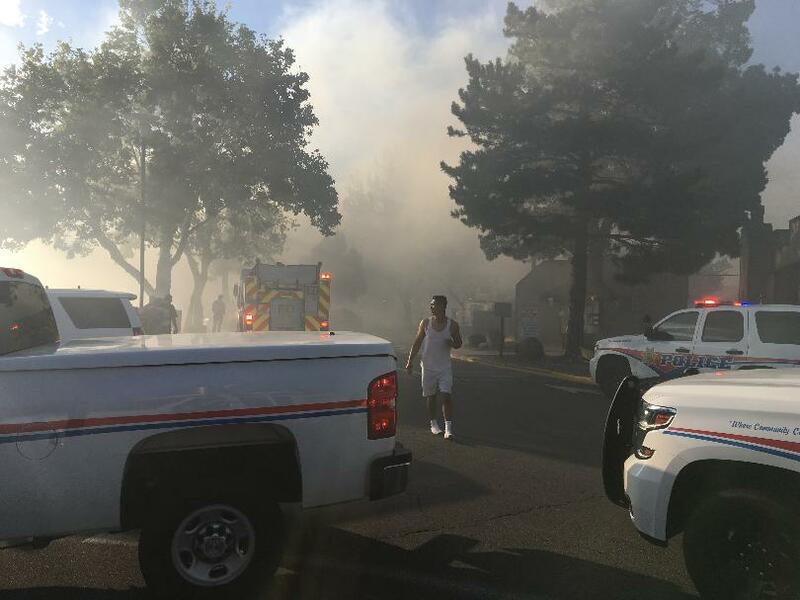 SPARKS, Nev. (KOLO) -- Sparks Police and Reno-Tahoe Airport officials say they are not ready to release information about the occupant(s) of a single-engine Beechcraft A36 that crashed into a Sparks trailer park Tuesday night. They say they want to make sure family members are notified before saying anything publicly about how many people were on board and their conditions. The plane that crashed was one similar to this Beechcraft A36. Airport Authority spokesman Brian Kulpin says the National Transportation Safety Board is taking over the investigation as of Wednesday morning and will take over releasing information. Ian Gregor with the Federal Aviation Administration says the plane was on descent toward the nearby Reno-Tahoe International Airport, but he did not say where the plane was coming from. 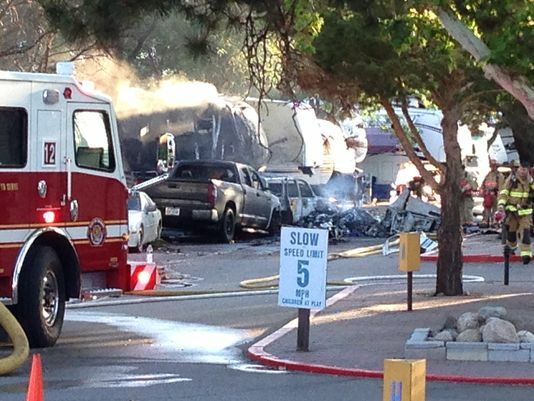 The plane crashed into the River's Edge RV Park in Sparks on Rock Boulevard. It happened about 6PM August 30, 2016. Bob King with Sparks Fire says the plane hit the ground and did not come into direct contact with any RVs. 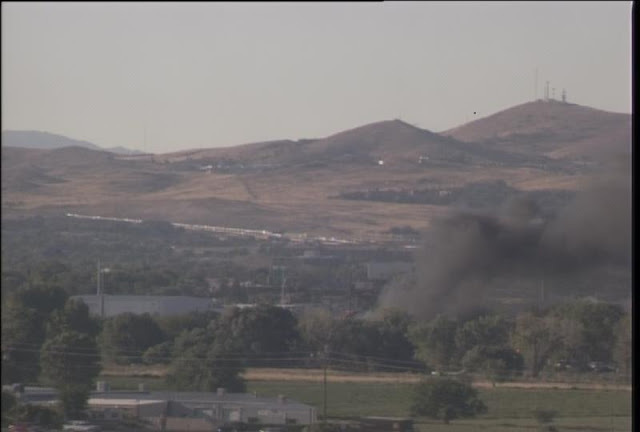 It does appear, though, that fire from the crash spread to surrounding RVs and vehicles. 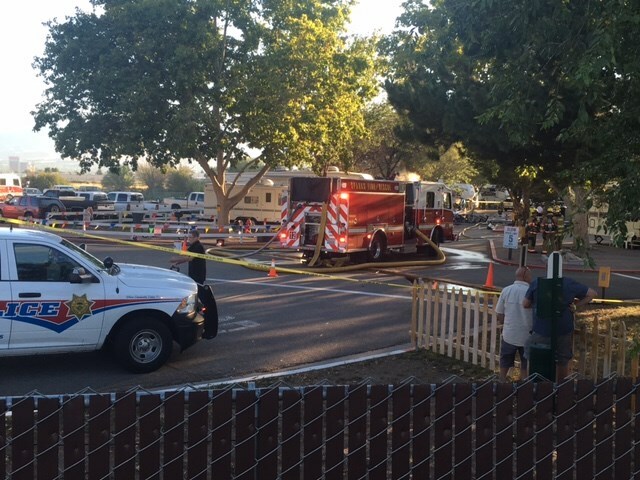 SPARKS, Nev. (News 4 & Fox 11) — A small plane crashed into a Sparks trailer park on Rock Boulevard early Tuesday evening, authorities have confirmed. The crash, reported at about 6:15 p.m. Tuesday, sparked a fire at the Rivers Edge RV Park, prompting a response from several area agencies, including Sparks Fire, Truckee Meadows Fire, Reno Fire and law enforcement. Crews arrived on scene and put out the fire, then proceeded to evacuate residents, King said. The plane crashed into asphalt in the park, police said. No trailers or cars were struck in the impact, though a few were damaged, likely from debris. Nobody in the trailer park has reported reported any injuries, but the status of anyone in the plane remains unknown.